Happy Holidays from snowy Seattle! Last night brought some of the first snow to our beautiful City and as I sit writing this, most of the snow still hasn't melted! I've spent the day drinking mugs of hot chocolate and staring out the window at the oh-so-lovely winter white blanketing my neighborhood and City (yes staring out the window, because it is way to cold to head outside). 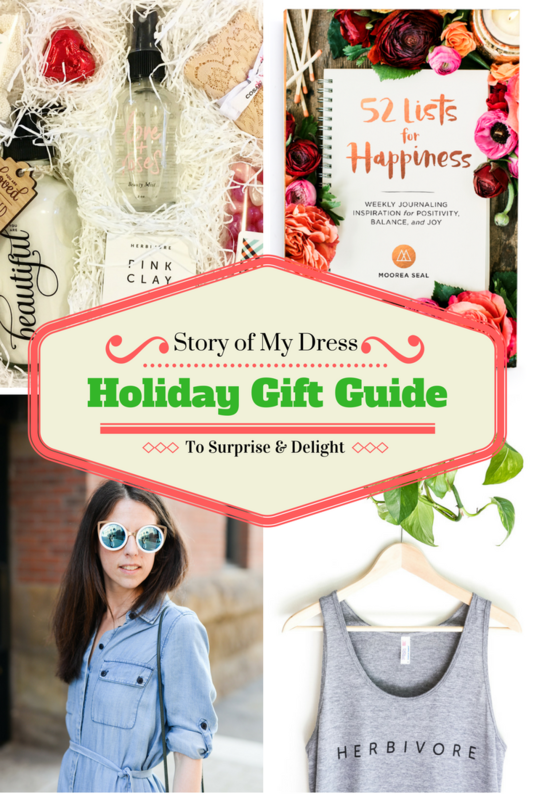 It's definitely gotten me in the holiday spirit, making today the perfect day to share this year's holiday gift guide with you! Filled with gifts to surprise and delight, this year's holiday gift guide has something for everyone on your list! I've even included a few things you might want to consider as #treatyoself gifts, because we all deserve a little self care during the holidays. Speaking of #treatyoself, be sure to check back next week for a very special giveaway, worth over $500, that includes many of the items found in our holiday gift guide! Because 'tis the season! One of my favorite gifts this holiday season! 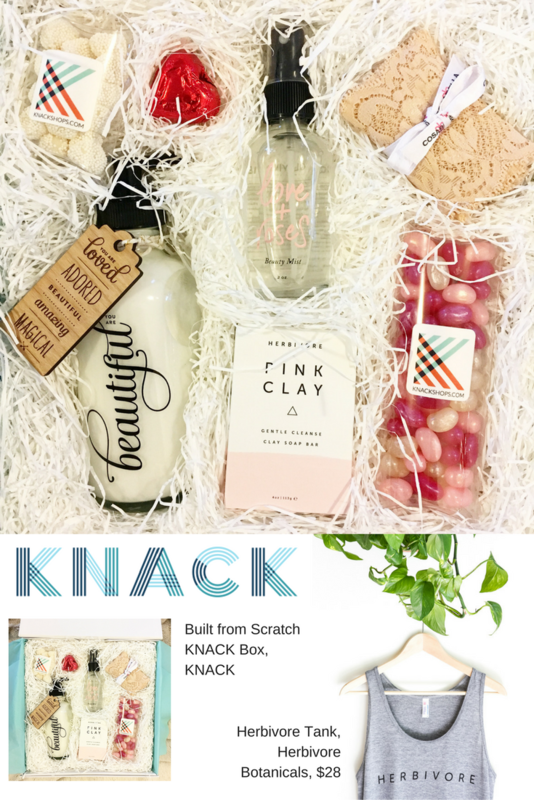 At KNACK you can create made-to-order gift with your own personal touch for, well, pretty much everyone on your list; hello one stop shop! Build a custom gift from scratch, discover exceptional artisan products, and delight every recipient on your list! And if you live in Seattle (where KNACK is based) you can use Postmates to deliver KNACK products within just one hour right to your doorstep; or pick it up at their showroom at 1306 E Pike St! Through 12/31/16, use code LISA15 for 15% off one order! J'adore this tank from local Seattle company Herbivore Botanicals! It's an easy, breezy go-to tank that is sure to be loved by every vegan and vegetarian on your list. With 15% of proceeds donated to the Nature Conservancy, they'll love that this tank helps protect the planet and contributes to local and global ecological preservation efforts. Perfect for sun protection from bright snow or sun, these sunnies are sure to surprise and delight! A perfect stocking stuffer or under the tree gift, every fashionista on your list will love these sunglasses! Coffee lover on your list? This tee just might be loved as much as their morning cup of jo or afternoon shot of espresso. Whether they enjoy a french press, drip or pour-over, every coffee lover on your list is sure to enjoy wearing this tee from Headline to their favorite coffee shop. 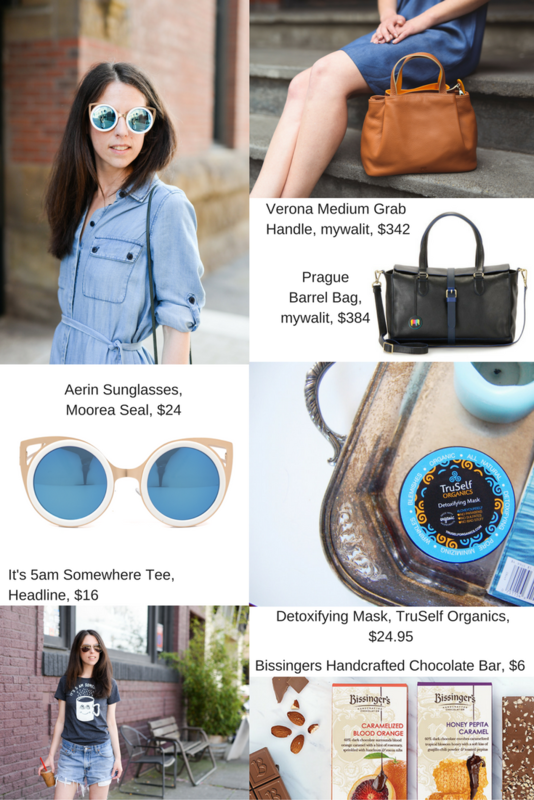 For that sister, girlfriend, mom or bestie that loves a pop of color, consider a bag from mywalit. An Italian brand of designer leather goods, mywalit is known for it's creativity and fun, making bags that are whimsical, colorful and innovative! The Verona Medium Grab Handle and Prague Barrel Bags make great gifts for any bag lover on your list! This mask is fit for every queen and beauty lover on your list! Made with only the good stuff, the Detoxifying Mask from TruSelf Organics is 100% organic, not tested on animals and contains no synthetic chemicals, colorants, scents, or parabens. The perfect gift to say "take a moment to treat 'yo self!" Originally crafted for European nobility, Bissinger's chocolate bars are a perfect stocking stuffer for every queen, king, prince, princess or jester you know. They make a great gift add-on or or for showing a small token of appreciation during the holidays. Available in a variety of flavor profiles (coffee toffee is my current favorite) , this signature European chocolate is sure to delight every chocolate lover and sweet tooth you know. Searching for that gift for that one person on your list who can truly make a room stop? The casual sophisticate with something to say? 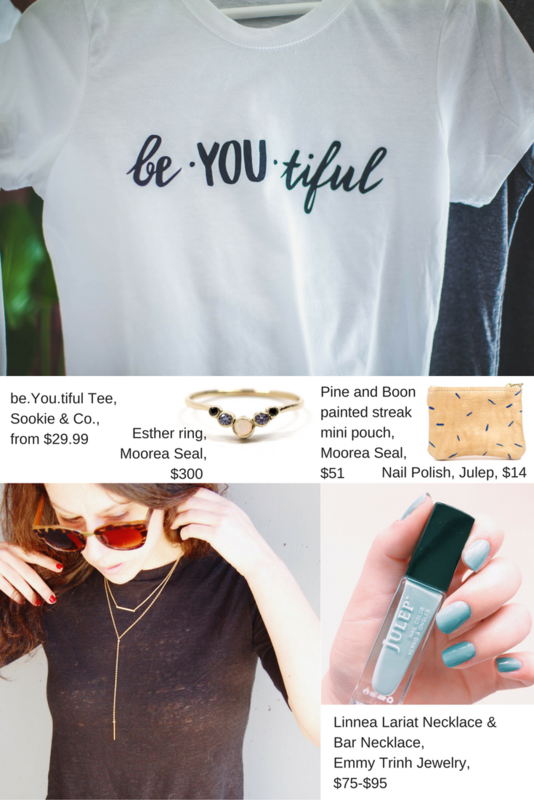 This Sookie & Co. be.YOU.tiful tee will do the trick! Designed to mix and match and mix and match, Sookie & Co. tees are perfect for tucking into skirts, layering over slip dresses, or pairing with denim and are sure to please. Jewelry lover to find a gift for? The Esther Ring by Designer Rho + Jo is a beautiful and delicate piece that will last generations. This ring is regal beauty. Solid 14k gold with Alexandrite, opal and black spinel stones. Made in Los Angeles, California. How cute is the pouch?! Perfect for stashing lipsticks, hair ties and train fare, the Pine and Boon Painted Streak Mini Pouch is handmade in Seattle, Washington and sure to gain your gift recipient loads of compliments. Julep nail polish makes the perfect stocking stuffer! Pick up a few in holiday colors or the favorite shades of your recipient and treat someone to a fast drying, long lasting nail polish that is made from a 5-free vegan formula. The high shine polish helps make nails more healthy and beautiful at the same time. Designed for women who desire simplicity and modern elegance, viewing jewelry as an essential party of their wardrobe, Emmy Trinh Jewelry is sure to please any jewelry lover on your list! The Linnea Lariat Necklace and Linnea Bar Necklace are timeless and versatile pieces that will easily integrate into your recipients wardrobe and become favorites for years to come! Writer or journal lover on your list? 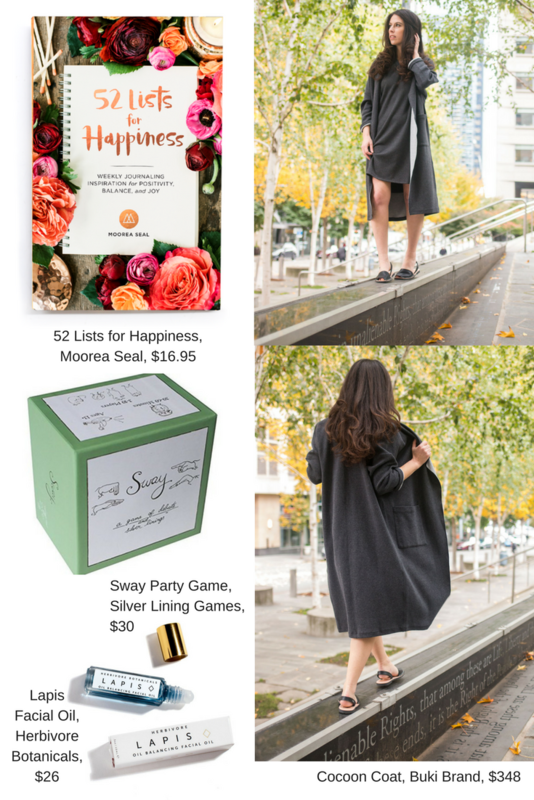 52 Lists for Happiness by Moorea Seal is a must-have gift for them. This beautiful, open-dated, hardcover journal contains 52 list prompts to encourage the reader/writer to explore how to live a happier life everyday. Sway: A Game of Debate and Silver Linings is the perfect gift for the party host/hostess. Sway is a party game with a decidedly positive attitude that anyone can have fun playing. It's a game of debate where players go head-to-head on totally different topics, arguing the 'pros' of their topics and competing fun challenges while arguing their point. The game results in guilt-free laughs and is perfect for games nights, girls weekends, or family get-together's. Another pick for Beauty lovers on your list. Lapis Facial Oil makes a great stocking stuffer and any beauty enthusiast (or anyone in need of relief from skin irritation) will thank you. This is an up and coming cult favorite that is named for the precious blue oil it contains, Blue Tansy. The travel size is perfect for tossing in a purse or adding to a carry on. And the packaging is truly lovely! Elegant, beautiful and versatile, the Cocoon Coat from Buki Brand is definitely at the top of my list this year (hint hint!) and perhaps yours? Perfect for wrapping up in on cold winter days with a mug of hot chocolate and favorite magazine, the oh-so-luxe Cocoon Coat is sure to be worn from the moment it's unwrapped. A nice and sweet perfume can be a great gift for holidays. I always a fan of Dior perfumes. For holidays, you can gift Dior perfumes to your closest friends or family members.